A common Indian sweet is Gajjar Ka Halwa ~ Grated Carrot Halwa with chai spices, raisins and cashews caramelized with sugar. This is the same recipe, but I just used pumpkin instead of carrot. 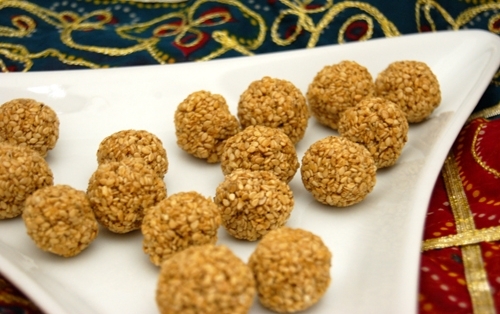 This sweet can be served in cup garnished with nuts or molded into an Indian sweet. 1) In a large skillet, melt ghee on medium-low heat. Add jaggery and dissolve into ghee. 2) Add shredded pumpkin. Place the lid on the skillet and simmer on low heat for 30 minutes, until pumpkin is cooked. 3) Remove lid and further reduce until all liquid is absorbed. Fold in cashews and ARVINDA'S CHAI MASALA. Serve warm in a decorative glass with a freshly grated nutmeg.